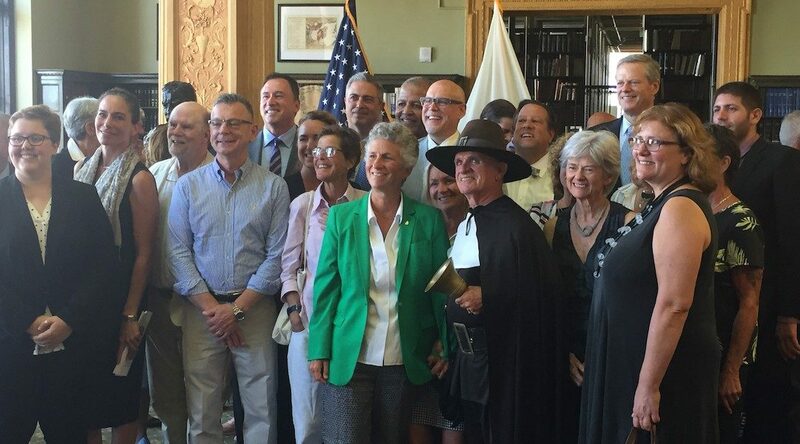 On Tuesday, August 28, 2018 members of the Provincetown 400 Taskforce Team, along with the Town Crier, traveled from Provincetown to the State House for the Official Kickoff of the Plymouth 400 State Delegation. Governor Charlie Baker kicked off the event by announcing the official schedule to the Plymouth 400 Commemoration. Other speakers included Representative Sarah Peake of the 4th Barnstable District; Senator Vinny deMacedo of the Plymouth and Barnstable District; John “Jim” Peters, Executive Director of the Massachusetts Bureau of Indian Affairs; Michele Pecoraro, Executive Director of Plymouth 400, Inc.; and Senate President Therese Murray. Representative Sarah Peake shared the history with attendees about the Pilgrims’ first landing in Provincetown Harbor and how excited Provincetown is for the commemoration. Provincetown 400 is overseen by the Pilgrim Monument and Provincetown Museum and board members in attendance today were board president Courtney Hurst, Paul de Ruyter, Joseph Collins, John Jay Wooldridge, Jan VonFlatern, Charles Roberts, Brian Johnson, Laureen Prophett, Michael Glasfeld and Executive Director Dr. K. David Weidner.